The CASSE Team was privileged to attend and participate in the inaugural National Aboriginal and Torres Strait Islander Suicide Prevention Conference held in Alice Springs on the 5th and 6th of May. Presenting on the Men’s Tjilirra Movement from CASSE were Pamela Nathan, Director of CASSE’s Aboriginal Australian Relations Program, Jamie Millier Tjupurrula, Program Manager – Men’s Tjilirra Movement, and Nathan Brown, Translator and Cultural Consultant. 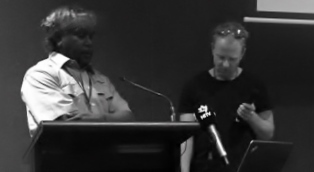 They presented alongside Martin Jugadai, Ngangkari (Traditional Healer) and Cultural Consultant, and David Beveridge, Senior Mental Health Clinician with the Remote Mental Health Team, both of the Royal Flying Doctor Service (RFDS). ‘We are here today in the face of grief, sharing our stories to help lift our hearts again’: The Point’s Stan Grant addresses the National Aboriginal and Torres Strait Islander Suicide Prevention conference in Alice Springs Friday, May 6, 2016. The old man had come in from the bush to Alice Springs for this suicide prevention conference. He has lost a nephew and a grandson to suicide. Like so many of our people across this country he is mourning another lost generation. He is not alone here. Brother, sisters, sons and daughters have all gone before their time. Each have their own story but together we share a sadness that stretches across the centuries. My friend Ernie Dingo told me of his meeting with this old man. Ernie said it hit him in the heart. The old man wasn’t speaking just of suicide, he spoke to the sleeplessness of a people who are struggling to hold ourselves against the world. He was of course talking about the violent history of Europe – the memory of war and holocaust. But it speaks to us here too. The memory of wounds we know are our memories. These are the memories we are born into. Memories of loss and sadness – memories of grief. These memories are not just carried within us – these memories seep deep into our soil. Our very land can feel heavy with despair – the rolling hills – the jagged mountains – the deserts and plains – all of it can feel so terribly sad. I have felt it on those times when I am sitting alone or driving. I have felt it sitting beside our waterholes and rivers. These places with names like Poison Waterholes Creek or Murdering Island. I feel it because these places have been places of death for us. It is easier – we know this all of us here – it is easier sometimes to live in our sadness than it is to embrace joy. We love and we find laughter in each other, but we check ourselves because we know too well that grief waits for us. That soon it is also likely we will bury yet another of our people gone too soon. The mourning will begin again. Sadness is so familiar that we mistrust happiness – sadness has come to tell us who we are. It is the well from which we draw our identities. Happiness can feel like surrender like letting go of the memory of wounds – memories that keep our families, our past alive. I am aware that today I share this place with some of you who are grieving now, who have buried loved ones, who have lost family to the crippling, to despair that leads to suicide. Welcome together to share our stories, because we know for so long we were written out of our nation’s history. This was – in the words of anthropologist Bill Stanner – the great Australian silence – a cult of forgetting on a national scale. The French philosopher Paul Ricouer says: “We must remember, because remembering is a moral duty we owe a debt to the victims, by remembering and telling we stop them from being buried twice”. We cling to our stories to keep our people with us as we were being written out of history. And these are our memories of wounds. We know that it’s this untold history that can divide us still in Australia – this forgetting festers like a sore. Reconciliation is built in sharing and hearing our stories. In this sharing we can begin to see each other in each other. To see our common humanity. I like to imagine we are bridging that divide but sometimes it can seem so wide. If we needed reminding, we got it in the death of a young girl in Western Australia. She was ten-years-old and she took her life in a remote corner of the state. Ten-years-old – a girl who should have been giggling with her friends at the back of the class or skipping rope in a playground – who could not face another day of life. She is one of so many of our children lost. Their lives should speak to every heart. Instead she was another Aboriginal girl dead in an Aboriginal community. We don’t speak enough of these children as Australian children. 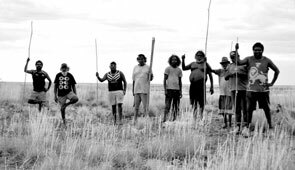 We don’t speak enough of these communities as Australian communities. In the minds of too many, I fear, this is still a black problem – these are black lives: remote and distant. Imagine such a death in an Australian town. Imagine an Australian town where children under the age of 14 were nine times more likely to take their own lives. Imagine an Australian town where suicide was the biggest cause of death for people under the age of 35. Imagine an Australian town where a quarter of the adult population was behind bars, with 50 percent unemployment, with people living 20 to a house. This would not be a problem so remote and distant. Why is it so difficult to imagine us as anything other than a people trapped in an inexorable and permanent decline. We have too often been trapped in the imaginations of white Australia – we have too often been prey to the tyranny of low expectations. It has been as though the very foundations of our society could not find common cause with the modern world. Bill Stanner – a great friend to Indigenous people and an incisive thinker -wrote of us in the 1960s. He didn’t mean offence. He was identifying a disconnect between two apparently antithetical traditions. But 50 years later we are here to prove him wrong. We know we are walking in the dreaming and working in the market. We will not be kept out of the glory of Australia – we are the glory of Australia. We don’t bring economic power we don’t hold the keys to political influence, but we speak with a different power: the power of our country. And that power can bring down walls. It is the power of Lingiari and Mabo and Perkins. We stand at the walls that have held us out with the might of Joshua at the Gates of Jericho. We know our bible stories, we know how Joshua commanded the trumpets to blare and the walls crumbled. Well we speak with an awesome power too. Australia for all its riches knows in its heart that the path to belonging in this land comes through us. And we have held out a hand of welcome often – even when that hand was spurned. But as much is asked of Australia – much is asked of us too. We have a great cause and we have a great responsibility. We can not look away from our failings. Where we see violence, where we see abuse, where we see our own closing down the worlds of our children, we need to stand up. We cannot cling to our misery if it means passing that to our children. We cannot just cling to endless grievance – this cannot be the foundation of our identities. If the price of liberty is forgetting, then I am prepared to let go of my memory of wounds. Before he died the great Crow Indian chief Plenty Coups spoke words that speak to our hearts too. For two centuries it has sometimes seemed for us too as if nothing happened. But we are here today, in the face of grief sharing our stories to help lift our hearts again. We are here to learn how to sleep again at night. Click here to view Summer May Finlay’s overview of the conference, published in the Croakey Blog.